With an total volume of some 1 million tonnes in 2013 Belgium is among the larger air cargo generating countries in Europe, as can be concluded from the annual report compiled by the National Bank of Belgium (NBB). For the latest report, published last November the NBB has used data up to 2012, with an occasional update for 2013. Based on that year’s figures Belgium’s two major air cargo gateways, Liege and Brussels ranked 8th and 9th respectively in the European top 20 of air cargo airports. Added up Liege’s 561,000 and Brussels’ 430,000 tonnes give a total of 991,000 tonnes. Thanks to Ostend’s 46,500 tonnes, the 1,000,000 tonne mark could be reached. Looking at the evolution since 2007 Belgium’s air cargo volume has been in decline, from a total of 1, 38 million to 1,041 million tonnes, bringing it back to the volume of 2003. The main reason for this is to be found in the ‘degradation’ of the Brussels DHL operation from a European to a regional hub. This downsizing operation contributed considerably to a drop of the Brussels cargo volume from 783.7 million tonnes in 2007 to 476.1 million in 2011. The decline of the DHL business also shows in the table on the value added in the airport cluster and airport activities from 2009 to 2012. The figure for courier and post activities dropped from 273.9 million euros to 199.3 (-27.2%). Yet, in 2012, purely cargo-related companies were well represented in the top-20 of direct value added, with TNT Airways ranking 6th (right behind Brussels Airport), TNT Express Worldwide (Liege hub) ending 9th and DHL Aviation on 13. 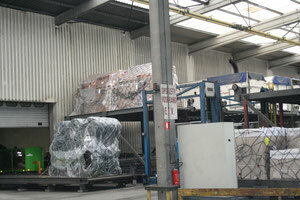 The ranking was led by Brussels Airport, which is also partly dependent on air cargo activities. The same goes for Swissport (11) and Aviapartner (16). Courier and post activities generated 2,882 FTE’s in 2012, a figure that has remained fairly stable since 2009 as the loss of jobs at DHL was partly upset by the growth at TNT. Federal express, too, saw its Brussels Airport workforce decline, but this was due to the relocation of its distribution centre from the Brussels Airport zone to nearby Mechelen. Liege Airport, dependent on the TNT operation to a lesser extent, was able to raise its volume from 489.9 in 2007 to 674.5 tonnes in 2011. Liege as well as Brussels was affected by the crisis years 2012 and 2013, bringing their figures down to the respective totals mentioned above. Ostend had a good run-up until 2007, when it would still handle some 107,000 tonnes, which was more than halved after the on-going recession. The coastal airport is active in the freighter-only market, which has been losing market shares across the world. On top of this, the airport seems to have specialised in African traffic, which generates quite substantial volumes of perishables, but fails to produce return cargo. On the other hand, the airport has developed a lot of skill in accommodating and handling Antonov AN-124’s, making it a favourite hub for oversized and project cargo. An important issue in the development of air cargo activities is noise and night traffic. The NBB reminds its readers that noise complaints haven frequently sparked changes to approach routes to Brussels Airports, much to the annoyance of foreign operators. Especially the conflict between regional – i.e. Brussels and Flemish – vs. federal rules may force carriers to re-think their services or move out of Belgium altogether.